The Euro Top Luxury Mattress has the extra layer of padding lines up with the edge of the mattress. Euro tops are sewn to create a flush, uniform appereance. The Euro top provides an extra layer of padding to improve intial comfort. 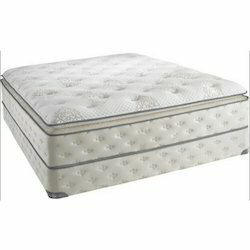 Dimension (Length x Width) 75" x 36" x 8"
We provide wide variety of Luxurious Bed Mattress. These bed mattresses are extremely comfortable and ensure great sleeping pleasure. Made from quality raw material, our array comes in varied forms such as Coir mattress, Spring mattress and Foam mattress. Quality and price can range from inexpensive ones used occasionally for camping, all the way up to high-end luxury beds. 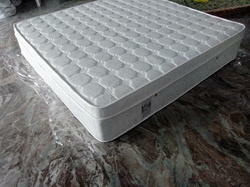 We offer wide range of Memory Foam Mattresses. It comes in varied designs and styles. This foam is appreciated for its comforting features. It has a ergonomic design, sensitive to body temperature & counter pressure to provide extra support. Most memory foam has the same basic chemical composition, however the density and layer thickness of the foam makes different mattresses feel very different and can be used in hospital. Looking for Luxurious Mattress ?